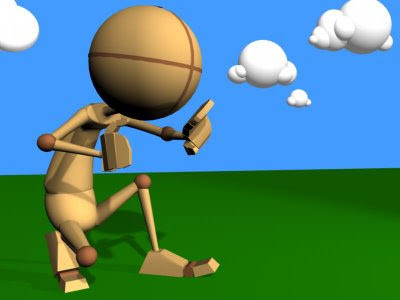 Week 4: Animate a "bowling ball" and "beachball" drop, bounce and stop in the same scene. I'm still trying to figure this out. This is the second part to week 3's assignments. 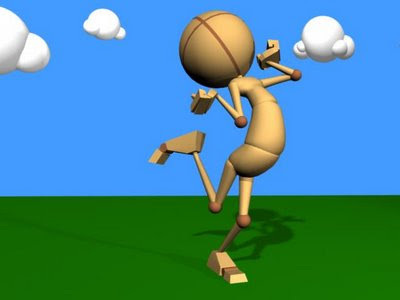 Here we were to animate a ball (provided by AM) bouncing like a basketball or soccer ball. I think the last part of the tiny bounces at the end was a little too much . . .
Week 3: This week we were to capture "excited". 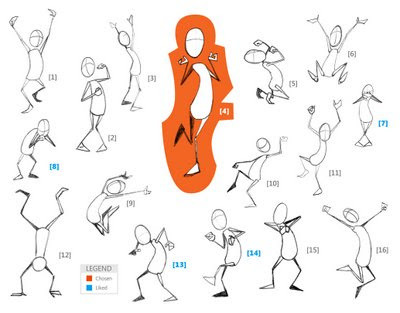 Problem is, it has all been done before so we can't do the typical "hands flung wide as the person is jumping in the air for joy" pose (as in sketches #6, 9 & 16). So, as I was sketching, I came across this photo of a woman with a contained excitement. I sketched it, then tried to get the Animation Mentor "Stu" character in the same pose. It kinda worked . . . but not quite. One thing they teach us is to exaggerate the gesture to get maximum impact. To get maximum impact, we have to keep all parts clear and distinct. 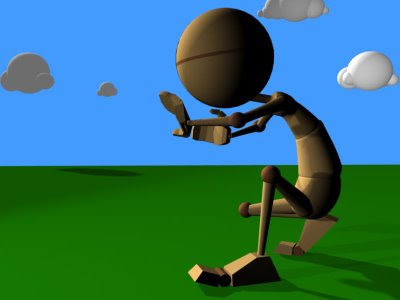 You find this out by looking at the silhouette your pose creates. If the silhouette has any overlapping parts, it's hard to read. No matter how I turned the camera, I never was able to get all the parts clear. Thus the pose was tweaked . . . Enjoy! Class 1 - "Basic Foundations" Has Started! Actually, this is week 2. The first week assignment was to get familiar with the online campus, set up our profile and photo. Sooooooo, this week, our assignment was to go out and sketch people in motion. 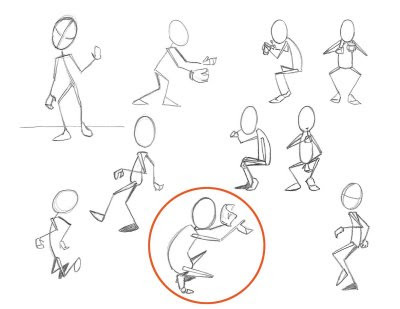 We were then to choose one, take the figure (provided by Animation Mentor) called "Stu" and pose him in the same gesture. As I worked on his pose, I tried to tighten him up a bit and make it a little more dynamic than in the sketch.